Good evening and welcome to the Chinese Embassy! It is a real delight to invite you all to celebrate the Chinese New Year with us. I would like to begin by extending my heartfelt thanks to all of you. I want to thank you for your support for China-UK educational exchange and cooperation. And I wish to pay particular tribute to the headmasters and teachers who have taken part in the China-UK Mathematic Teacher Exchange Programme. Education makes a country strong and prosperous. 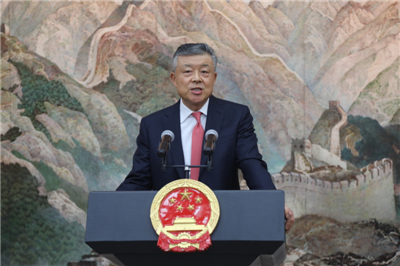 I have personally committed much of my time and efforts to China-UK educational exchange and cooperation. My colleagues at the Embassy call me “Education Ambassador”. I am proud of this title because the educational partnership between our two countries is an important part of our bilateral relations. It is also crucial for cementing public support for our bilateral ties. First, it is a signature programme for China-UK educational exchange and cooperation. In recent years, China-UK educational cooperation has been greatly enriched. It now covers pre-school education, basic education, vocational education, higher education and language training and cultural exchange. To meet the increasing need for further cooperation, the China-UK Mathematic Teacher Exchange Programme was launched. In just four years, this Programme has grown from strength to strength. It has now become a highlight in China-UK educational cooperation. As of today, five visits have been made between the two sides, involving more than 720 primary-school and middle-school teachers. This helps deepen and enrich the educational partnership between our two countries. Second, this Programme is a mutually-beneficial platform that helps students strengthen the foundation for long-term academic achievements. Mathematics, known as the “mother of all sciences”, is an important and basic academic discipline. 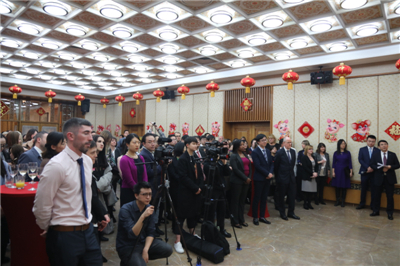 In recent exchanges under this Programme, 86 math teachers from Shanghai came to Britain and more than 90 British math teachers went to Shanghai. Focusing on improving their teaching ability, these teachers took part in various forms of learning and training. They had in-depth discussions, learned a great deal from each other and improved teaching skills. This has been hugely influential. It has brought direct benefits to hundreds of schools and tens of thousands of students in both our countries. It has given a fresh boost to our basic education. Third, this Programme is a useful experiment that enhances mutual learning and mutual understanding. Exchange and mutual learning between different civilisations are the irreversible trend of history. These are the sources for human progress as well as world peace and development. China and the UK are both great civilisations. As the first large-scale teacher exchange programme between China and a Western developed country, this Programme is of great significance to enhancing exchanges and mutual learning between China and the West. I am sure that, by teaching and learning together, the teachers and students participating in this Programme could have a better understanding of each other’s culture and forge a deeper friendship. The Chinese people often say, “If you plan for one hundred years, educate the children.” “If you make a plan for education, begin with the teachers”. These words underline the importance we attach to education and teachers. These words also highlight the great responsibility and glorious mission. First, learn from each other and improve teaching skill. China and the UK have respective strengths in math teaching ideas and practice. The UK is the world’s first country to establish a modern education system. It is home to great mathematicians such as Isaac Newton and Alan Turing. China has its great mathematicians such as Liu Hui and Zu Chongzhi. Their contribution to the world of science has enduring influence today. I hope that through this Programme, our teachers could learn from each other to complement the strengths of our two countries and achieve common progress. Second, educate our young people and build closer friendship between our two countries. State-to-state relations hinge upon close people-to-people exchanges and heart-to-heart communication. China and the UK differ in history, culture and social system. We are at different stages of development. This makes it all the more important for us to enhance exchanges and communication. This year marks the 65th anniversary of China-UK diplomatic relationship at the chargé d’affaires level. Over the years, China-UK relations have continued to grow despite twists and turns. And the reason for this lies, to a large extent, in the close exchanges and deep friendship between our two peoples. Young people are the future of our two countries. They are also the future of China-UK relations. Therefore, I hope that when you teach math, you will at the same time sow the seeds of friendship in the hearts of our young students. This will help pass our friendship from generation to generation. In just nine days, we will be celebrating the Chinese New Year of the Pig. In the Chinese culture, pig symbolises good fortune and happiness. 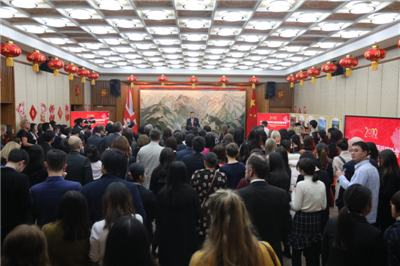 I hope and believe that, in this auspicious new year, with concerted efforts from both sides, the China-UK Mathematic Teacher Exchange Programme will explore new fronts, bear new fruits and make new contribution to China-UK educational exchange and cooperation! To a happy and prosperous Year of the Pig for all of you present today.